TERRY CYCLING GEAR: TROPICAL TEST - Terry Peloton. 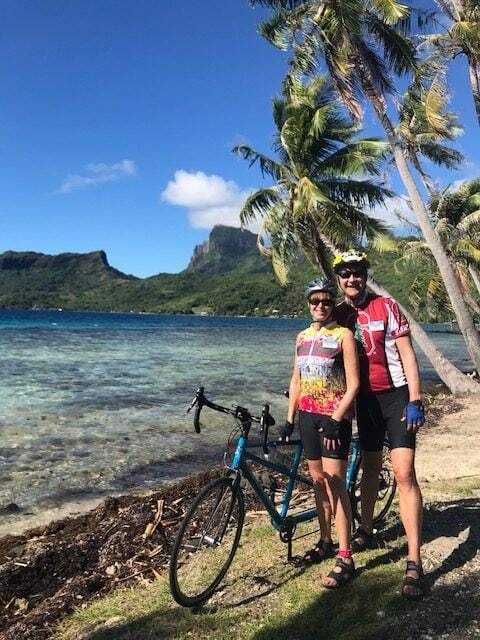 Terry customer and brand ambassador, Cindy Wienkers, took a selection of Terry cycling gear on her trip to French Polynesia, where she put it through its paces in demanding conditions: high heat and humidity, with varied terrain and daily rides, often of quite high mileage. She and her husband, Kevin, joined a Santana tour of the Polynesian islands, an absolute dream destination. 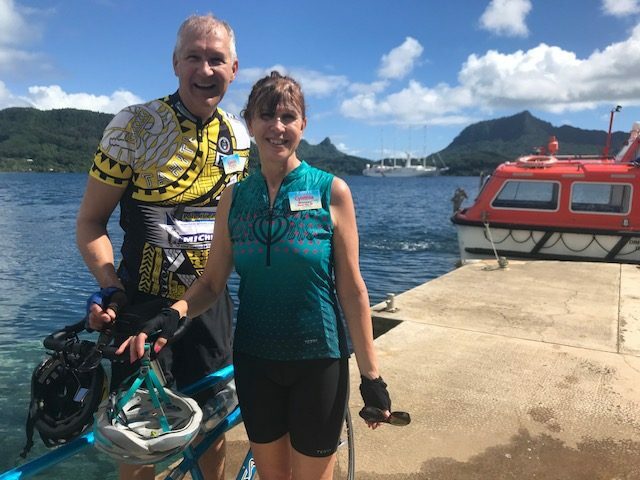 They raced, toured and relaxed by tandem, sailboat, cart and barge, enjoying the wonderful hospitality of the native islanders, along with many other local delights. What cycling gear did I pack? I packed only my Terry Bicycles apparel to wear on the trip. I knew it would be hot and humid and I don’t do well in the heat. It was the first time I decided to forget about dressing like my captain and go for comfort. And let me tell you, I am so glad I did. 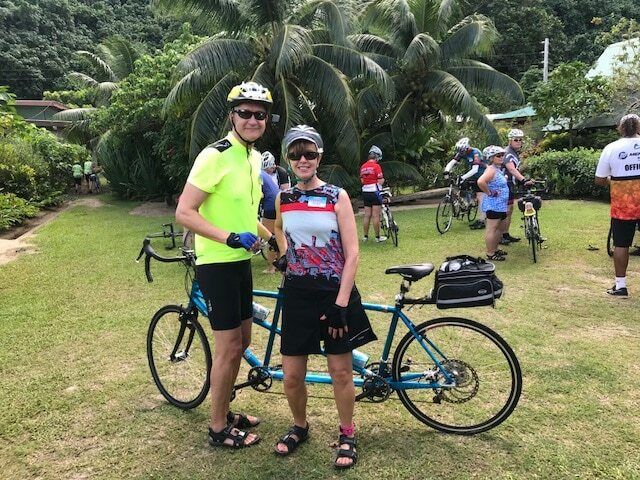 Many tandem couples dress alike when biking. I find the unisex jerseys to not be comfortable at all. 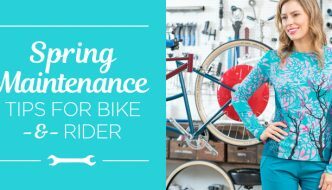 Over a year ago I was introduced to the Terry Bicycles line of women’s apparel. The fit and fabrics are amazing. I am an avid seamstress, and I appreciate the feel and appearance of really nice fabrics. Everyone has a different body build of course, so each person has their own favorite Terry pieces. I especially love the Soleil, Breakaway, and Sun Goddess tops. I love the SPF factor, the higher neckline on Soleil that keeps bugs from getting down my shirt (I am allergic to bee stings,) and the unique fabrics/styles. 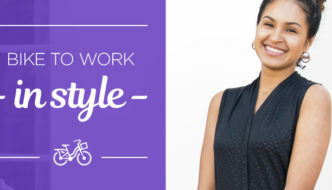 I have several tops that I wear not only for biking but also for working out at the gym. Many of the 3 pocket jersey styles also have a hole for my headphone cord – great when working out if you are not wireless. I brought various tops along on the trip. The sleeveless because I knew I would be melting (and I wore them every day), the Soleil tank because it is super comfy with a high neck, the short sleeve Soleil which is more of a ¾ length in case I needed some sun protection, and I even brought a couple light colored long sleeve Soleil in case I needed total sun protection on my arms. All of the Terry tops I brought could also be worn for casual wear. I wished I would have had my Sun Goddess tops with me, but I didn’t order them until I returned from the trip, knowing summer would be arriving soon in Green Bay. The bottoms I packed were the new Chill 7 elastic-free leg short, which I think is great, the Metro Skort, and the Fixie Skort (which I also wore for casual wear, but wouldn’t wear this one for a long cycling day), and Mixie Skort & Liner. Also one pair of knickers, the Breakaway, because they are a light weight and comfy fabric. I never wore the knickers though, as it was just too hot. Another reason for packing the knicker was in case I started having a recurring knee issue. My brace is more comfortable with fabric between it and my skin. How did my Terry cycling gear perform on tour? Besides being comfortable, all of the Terry items I brought along for the trip washed up easily and line dried quickly in our ship’s cabin. I had ordered the Metro Skort two piece with removable liner in both medium and large. I preferred the fit of the large, as it sat lower on my hips. The combo worked well, but I did find the waist band on the skirt stretched out and nearly fell off my hips after a pretty long and hot day of riding: hot, muggy and pushing the miles to keep the schedule. On the tandem as the stoker I sometimes have a lot more movement in my saddle than on my single, especially when pushing a little elevation. I sit on my skirt so any forward and back movement along with extreme heat could have caused the band to relax from the tugging on it. Once back home, the Metro skort did return to its original size after washing and line drying. Other ladies on the tour loved the Metro Skort! The knit charcoal gray Mixie Skirt fit well. I wore it for casual wear, and had it on for the road race (first day of the tour! 55 kilometers, hard, non-stop riding). Not sure if the chamois in the Mixie Liner is different from others, but I could have used more padding for that long ride. 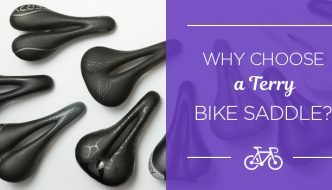 It’s probably better suited for shorter rides, commuting etc. After riding in the heat and humidity, my favorite bottoms for hot weather are now the new Chill 7 short, and the Fixie Skort. I justify all of the biking tops I own because I wear them Monday-Friday at the gym. The pockets and cord/headphone access hole are great. They are also great as I can toss on a clean one afterwards, to wear for errands. 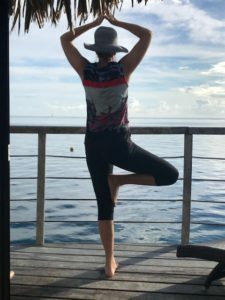 I was on the same trip to French Polynesia and wore my favorite Terry clothes as well. I was so surprised to see the photos in the recent ad and recognize the sights. Very cool. And that was an awesome trip. Small world!! Hi Cindy, I would have taken pictures of other gals wearing Terry if I would have known I was going to be asked to write a post. It was a great trip! Hope your summer is going well.